refer Dinesh Madaan for understanding of concepts. But your ultimate focus should be on study material. exemption in all the 7 papers but got 22 in ISCA. At last time, do question only from practice manuals. books. You have to do them at all costs. have time go through the theory part as well. as institute generally ask case study from this portion. and difficult to remember than the Companies law. on the same in the institute book. its a practical question or theory based. which recent case laws are based. whom you are taking tutions. 1. In practical problems never start your answer with Yes or No unless you are 100% sure. First mention the relevant provision and show in your answer how you reach the conclusion. In the end conclude your answer in the following manner: “On the basis of above discussion we can conclude that as per the Section-166 Annual General Meeting can not be convened on a public holiday.” (Consider this as an example). On the contrary if you are 100% sure from the very beginning always start your answer with Yes or No. Like in the above problem it is very much sure that AGM can not be held on a public holiday. 2. Try and always mention the relevant section. Make it a habit. Do not ask anybody regarding the importance of remembering a section. If you make it a habit now it will 100% pay at the time of your final preparation. 3. In distinctive question never segregate 2 provisions with the help of a line. For example: Distinguish between Fixed and Floating Charge Mention the distinction in the following way: (i) Fixed charge is created in the specific property on the other hand floating charge is created on the class of property. (ii) Fixed charge clutch the property whereas floating charge floats over the property. Conclusion: You should use “on the other hand” OR “whereas” to club two different provisions. 4. You may underline the relevant provision or any substantial provision. 5. In theory paper never read practical problems first. First attempt flat questions. Like in Audit or Law first attempt short notes or distinctions etc. Reason for not attempting the practical problems first is that in the beginning you have enough time to read it twice or thrice and waste your time. 6. If you mention any case law highlight it properly. Write it in the following way: Mohan Singh Rawat Vs. State Electricity Board 7. In distinction problems first write something (2-3 lines) about the topic. Example: Like in the distinction between Interim and Final Dividend write some about Interim and Final Dividend and mention in the end: “hence the points of distinction between Interim and Final Dividend are as follows” 8. In exam never use short forms like AGM, EGM, CG, CLB, ROC, ICSI, ICAI, SAP, AS. Etc. 9. When you start your answer by using a section use like this: “As per Section-171 of the Companies Act, 1956” 10. Try and make an effort to complete your paper 100%. In other words attempt full paper of 100 marks. This is very important for fetching more marks. 11. Try and avoid cutting of words. (See the example below) Whenever a company fails to file the annual accounts and annual returns, desc -ribed in sub-clause (A) of clause (g) of sub-section (1) of section 274, persons who are directors on the last due date for filing the annual accounts and the annual returns for any continuous three financial years commencing on and after the first day of April, 1999, shall be disqualified. Observe the first line of the Para above and see the word described. Half the word is in first line and half is in second line. This is some thing very poor as far as professional exams are concerned. So avoid it. ALL THE VERY BEST.. AND GIVE UR BEST.. KEEP CALM AND GIVE YOUR PAPER.. DO NOT PANIC..
Eg. Nana patekar ask partner shilpa shety about CA prospector being in south. not ignore them. E.g. Nov 11 paper. without question in our sleep. concrete base of concepts and you’ll crack the paper. value of money as it comes everywhere. have less burden at last moment. know the weight of topic. figures will be of immense help. when such questions are there in exam. read as compare to those long questions. concepts and not of numerical. best have a habit of reading in such format. everybody is in same boat. this way you’ll remember it. -comm. (deeds r vry imp.) n comm. -200 300 500 series SAs r imp. -Can Parliament enact laws on items in the State List? Chapters 1 – 5 – Company Incorporation etc. Chapters 23 – 24 – Sole selling agent, accounts etc. -Short notes on Back offices, front offices etc. inspection and take samples etc. -What is money laundering ? -What do you mean by manufacturing process ? -Who can be appointed as Occupier of factories ? -What do mean by participatory notes ? question is definitely useful for you . - Joint and By Product. - Reconciliation of Cost and Financial Accounts. - Operating Costing (Service Costing). - Integral and Non-Integral Accounts. - Job and Batch Costing. - Direct Labour & Direct Expenses. 2. What is meant by cost centre? 8. What is meant by Profit centre? 9. What is meant by Cost Driver? 11. What are Product & Period costs? 12. What are Avoidable & Unavoidable cost? 13. What are methods of costing? 14. What are techniques of costing? 15. What is ABC costing? 2. Explain the concept of "ABC Analysis". 4. Treatment of shortage in stock taking. 6. What do you mean by Bill of Material? 7. What do you mean by Input-Output Ratio? 5. What is Casual and Outworker? Cost Apportionment & Cost Absorption? 4. What are the classifications of overheads? 4. Write a short note on Cost plus contracts. 5. Write a short note on Escalation clause. 2. Offer & rules for an offer. Supervening Impossibility not applicable . 1. Who is liable to pay bouns? 2. Who is entitled to pay bonus? 4. What does available surplus mean ? whom it is payable ? As the CA FINAL exams are today.. few tips for FINAL students..
All I want to conclude u to..
And a VERY MUST TIP take blessings from your parents..i dont think I need to tell u why..
REASON 1-Carelessness towards carrer REMEDY-Be serious.else you will fell guilty throughout yur life even if you do smthng good elsewhere. REASON 2-Engaged in other activities during prepration (ie; marriage, birthday,familyget together,poojas) REMEDY-All these events can be complited without you REASON 3-Late start of study(want to become a ca just by study 2-3 months? Not possibile)[exceptin excluded] REMEDY-Start your study from the day you registred yourself with the insititute.you will be losing 1 marks every day if you dnt study from day 1 (what other important work do you have in hand) REASON 4-No proper planning n time allocatin for each subject REMEDY-Just dnt take the text book n start reading from the first chapter.plan yur subject yur intrest,have an overall fell of the book, chapters and their importance.dnt leave any chapter in option. REASON 5-Ignors study materails, suggested nd RTP. REMEDY-Study materials is bible first read this n then if required any refrence book, particulary theory subject.suggested r very much helpful in understanding the way institute ask a que. Nd expect us to answare. REASON 6-casual reading REMEDY- While reading one should not be casual in approach try to distinguish between similar concept and be clear!! views with some Do's and Don'ts. 1. Always write answers in points. 3. Presentation matters the most. need to play wisely to save time. were lengthier than the solution. 180 minutes decides your future. last and fill up the blank space. unrelated answers, but do write!! writing answer matters the most. Go Through the Important Theory Questions in Costing and FM, for CA IPCC May 2014 Exams. Even though enough care is taken while selecting the questions, students are recommended not to put in too much reliance on these. 1) Start With Theory in any of the two subjects u wish, But preferablly better to start with Financial Management as it is a Practical Subject u will become confident by chosing it First. Better if U read the theory chapter wise as reading all theory at a time doesn’t work..
a) First Start with Time Value of Money (an Easy and Important one ) – Base of Financial Management as it is applied in Capital Budgeting , Capital Structure Decisions which are major topics in Fm with this u will be able to solve the problems in these two chapters easily..
e) Now Move on to Cash Flow and Fund Flow Analysis for CFS much efforts are not required as it will be covered in Accounts Paper I just look at Funds Flow once.. 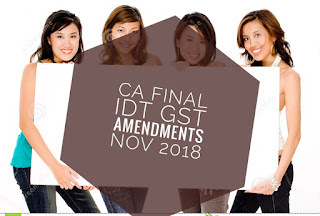 In this section in majority questions are asked on Deriving Working Capital(WC Statement) , Preparation of Cash Budget so concentrate more on these..
Now Let’s Move on to Second Part Costing..
6) At Last take on the Reconciliation of Cost Accounts with Financial Accounts as a finishing Step..
All the best for your Preparation…. Certain gifts are liable to income tax as “income from other sources”, Sec 56(2)(vi). However, this provision is applicable only for individuals and Hindu Undivided Families (HUFs). Thus, if gift is received by any Trust or AOP, then it is not liable to income tax as “income from other sources”. The provision of taxation of gifts became applicable in respect of gifts received on or after 1.9.2004 and before 1.4.2006 if the gift money exceeded Rs. 25,000. From 1 April 2006, this amount has been increased to Rs. 50,000 so that cash gifts and gifts by cheque or bank draft from non-relatives and from non-exempted categories can be fully exempt from income tax up to Rs. 50,000 in aggregate in one financial year. Importantly, the provisions of the aforesaid Section 56(2)(vi) applicable to the taxation of gifts in excess of Rs. 50,000 in a financial year in the aggregate are applicable for gifts received from non-relatives. For example, if Mr. A receives a gift of Rs. 200,000 in cash from his maternal uncle, that is, his mother’s brother, it would be exempt since the maternal uncle would be brother of the parent of the individual concerned and would come within clause (iv) of the aforesaid Explanation. Hence, whenever you receive any gifts from relatives you must carefully apply the test to ascertain whether the person concerned falls within one of the seven categories of “relatives” or not. If a person who makes a gift does not fall within any of the above categories, then he would be considered as a non-relative and gifts from such people would be exempt only up to the extent of Rs. 50,000 in a financial year. It may be noted that since a Hindu Undivided Family can’t have relatives, any gifts received by it in excess of Rs. 50,000 in a year would be liable to full income tax.